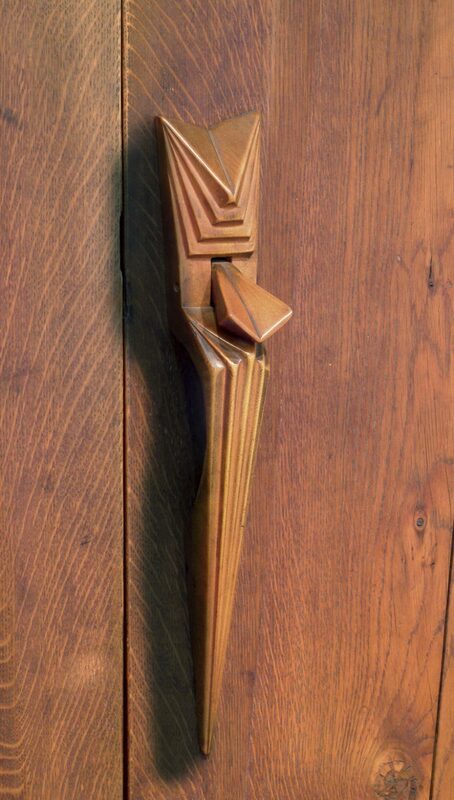 Wharton Esherick’s carved interiors are among his most important early sculptural work. Inspired by the angular shapes and intersecting lines of the Cubist movement, the artist incorporated the natural patterns and grains of assorted woods into his pieces to emphasize their strong geometric and organic forms. Born in Philadelphia in 1887, Esherick studied painting at the Pennsylvania Academy of the Fine Arts from 1908–10, and discovered wood as a medium for artistic expression when he began to make carved frames for his canvases. 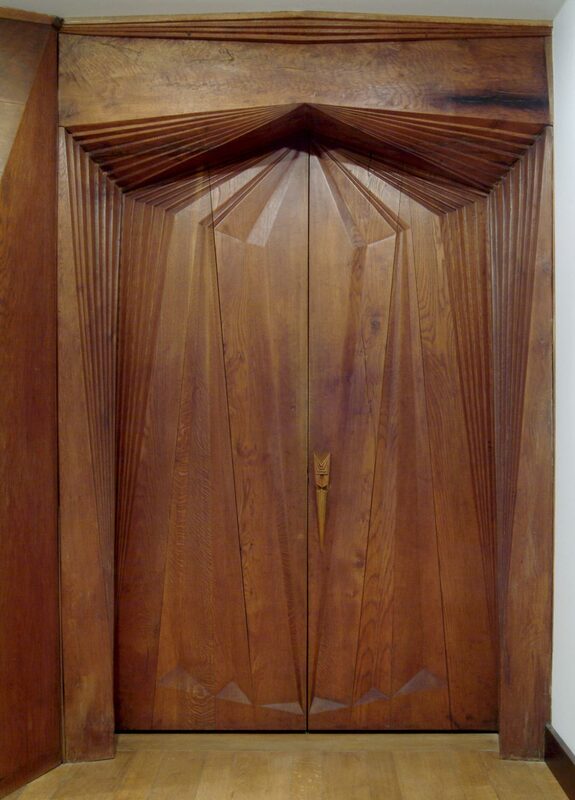 By the mid-1920s he was fully committed to sculpture and extended his definition of the medium to the carving of furniture and architectural interiors. His work is often seen as a forerunner to the contemporary studio furniture movement. Born in Philadelphia, where he was trained as a painter in the first decade of this century, Wharton Esherick had shifted his attention to wooden sculpture and furniture by the mid-1920s. His devotion to wood as a material and insistence upon handcraftsmanship (although often using innovative production techniques) combined with his free-spirited personality to establish Esherick as a pioneer of the contemporary American craft movement. The commission to renovate the home of Judge and Mrs. Curtis Bok in Gulph Mills, Pennsylvania, offered him a rare opportunity to devise an overall scheme of dramatic wooden elements that would transform the interior spaces. 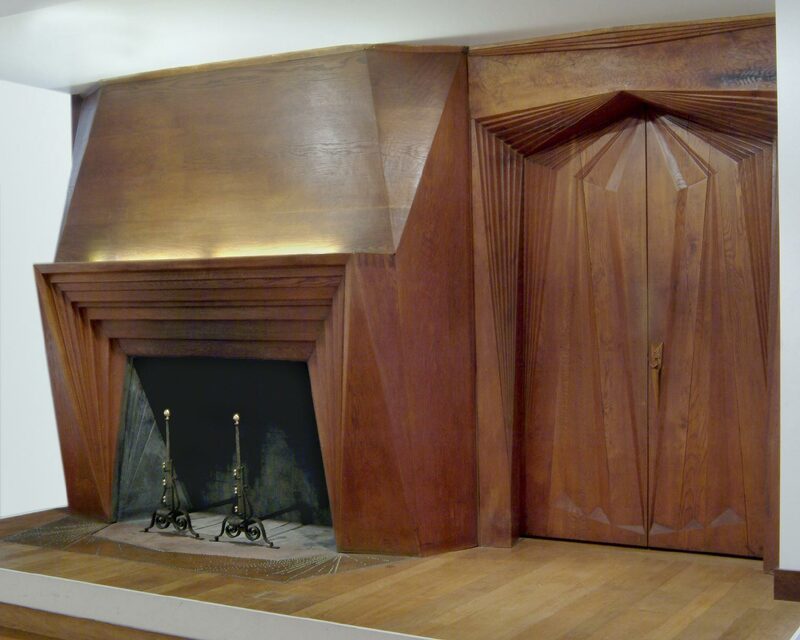 As this fireplace and doorway from the library and music room of the Bok home demonstrate, Esherick used angular motifs in the contemporary "modern" style adopted by other designers and architects of the day, but the sensuous, hand-finished surfaces that emphasize wood grain and color, and the massive beams and planks, boldly carved and assembled into projecting and receding shapes, are unique to the artist. Darrel Sewell, from Philadelphia Museum of Art: Handbook of the Collections (1995), p. 298.